The goal: to make healthy pancakes that resembled that IHop feeling. I wanted to make pancakes that no one would realize were healthy too because they had that buttery, delicious taste. It WORKED, and it worked in the most fantastic way. We decided to make it a brunch, so we had these pancakes alongside a fabulous veggie omelette and some fresh fruit. I added a little bit of garlic ghee, shiitake mushrooms (such health benefits!) and kale to mine, along with this new goat cheese I bought (super yum!). I also added a bit of avocado on top for some extra benefits. The fresh fruit I used was pluots (apricot plum mix), apricots, watermelon and white peach (which was my definite fav - so sweet!). I like making mini pancakes with my mini pancake pan. You get to eat a whole bunch, and everything mini is just fun, right?! Whisk eggs, butter, and milk together. Slowly add flour into the batter and mix. Sprinkle cinnamon on top and mix. Spray ghee spray onto mini pancake pan. Pour batter and flip once bubbles appear. Remove and enjoy! Should make 20-30 mini pancakes. 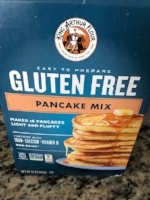 I added a little unsweetened vanilla coconut yogurt to the top of the pancakes with a handful of goji berries for some even EXTRA health benefits and flavor, but you don't have to add this for a great meal. Most important part of this meal, EN JOY...truly enjoy. Sending love and happiness your way.